Fantastic sounds from the years before reggae became the international sound of Jamaica – music from the island nation's jazz scene, which was at the crossroads of so many different styles of music – jazz from the north, Latin rhythms from Cuba and Puerto Rico, and a fair bit of other Caribbean sounds too – all of which filter through the wonderful collection of music on the set! The title breaks down the different genres featured – but there's often a surprisingly unified feel to the whole record too – one that stands partly as a testament to the musical strengths of all the performers involved! In the days before Trojan and Studio One, Federal Records was an important Jamaican label – and did an especially great job of capturing some of the sounds that were part of that nation's club culture and resorts in the 60s. 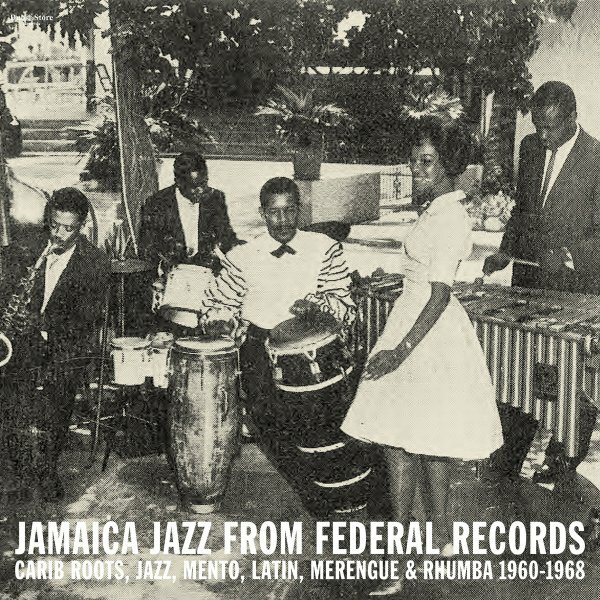 Titles include "Angelima" and "Like Falling In Love" by Ernest Ranglin, "Profile Cha Cha" and "Rhumbina" by Cecil Lloyd & The Starline Troubadors, "Estrellita" and "I Love Paris" by The Lennie Hibbert Combo, "Tis Wonderful" by Eric Grant, "Linstead Market" by Baba Motta & Ernest Ranglin, "Wheel & Turn Me" by Bertie King, "Go Fife Go" by Count Owen, "Mango Walk" by Bertie King & Ernest Ranglin, "String Of Pearls" by Auldey Williams & His Orchestra, "Solas Market" by Baba Motta, and "Monday Monday" by Winston Turner Quintet. © 1996-2019, Dusty Groove, Inc.